Sometimes referred as the iliacus minor or ilioinfratrochantericus. This muscle hasn't received much attention in the literature and some authors refer to it as the accessory iliacus, as it cannot be separated from it. Lies beneath the rectus femoris and to the lateral right of the iliacus. The cadaver dissection shows the anterior aspect of the hip. 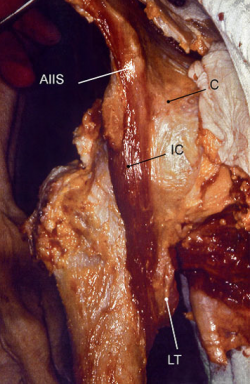 The iliocapsularis muscle (IC) originates from the anterior-inferior iliac spine (AIIS) and the anterior hip capsule (C). Its insertion is located just distal to the lesser trochanter (LT). Approximately 1.5 cm distal to the lesser trochanter. Profunda femoral artery, a branch of the femoral artery. Lateral femoral circumflex artery, a branch of the profunda femoral artery. The iliocapsularis has an important role in hip stability hence its attachment to the ateromedial hip capsule. It pulls the capsule with the zona arbicularis in a superior and medial direction. This function might be more tangible in dysplastic acetabulum, when the muscle contraction tighten the capsular structure and helps stabilizing femoral head within the acetabulum. Several biomechanical studies supported the role of the iliocapsularis as an important hip stabilizer and synergistic to iliacus during walking and in contralateral hip extension. The prevention of pinching of the anteromedial part of the capsule between the femoral head and the acetabulum is also attributed to the iliocapsularis due to its attachments. Anterior hip pain with hip flexion might indicate subspine impingement, a condition which arises from a collision between the anterior femoral neck and AIIS with abnormal morphology during hip flexion. Due to its attachment to the AIIS, the iliocapsularis could contribute to new osteophytes formation when a mechanical load is applied through it this point (Wolff’s law) and could be a potential cause of subspine impingement. Therefore, it should be considered in differential diagnosis of hip impingement. Loss of function of liocapsulais, either by atrophy or weakness, can possibly lead to entrapment of the capsule between the joint surfaces. Iliocapsularis is also an important land mark for surgeons e.g. Bernese pericapsular osteotomy. ↑ D’Costa SU, Ramanathan LA, Madhyastha S, Nayak SR, Prabhu LV, Rai R, Saralaya VV. An accessory iliacus muscle: a case report. Rom J Morphol Embryol. 2008 May;49(3):407-9. ↑ Andersson E, Oddsson L, Grundström H, Thorstensson A (1995) The role of the psoas and iliacus muscles for stability and movement of the lumbar spine, pelvis and hip. Scand J Med Sci Sports 5: 10-16. ↑ AnderssonEA, Nilsson J, Thorstensson A (1997) Intramuscular EMG from the hip flexor muscles during human locomotion. ActaPhysiolScand 161: 361-370. ↑ Lewis CL, Sahrmann SA, Moran DW (2007) Anterior hip joint force increases with hip extension, decreased gluteal force, or decreased iliopsoas force. J Biomech 40: 3725-3731.